Yes! Magazine is almost unique: a publication with positive stories about change, rather than the steady diet of gloom and doom that was the usual reading fare. 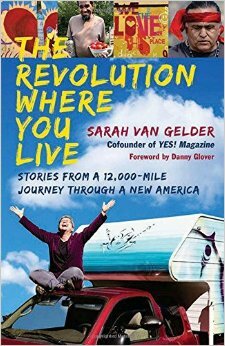 Sarah van Gelder, is a cofounder of Yes! But even someone who has been bringing stories about solutions instead of just problems to the public can get depressed sometimes, looking around that the enormous challenges we face in this world and this country. From economic to environmental meltdowns, the crises are overwhelming. But her new book, The Revolution Where You Live, is filled with inspiring stories of ordinary Americans working together to confront power, take it back and make their communities better. The issues they confront range from threats to their land and water, workplaces closing down, poor access to healthy and adequate food and housing — and more. From Native American reservations to the midwestern Rust Belt to the Northeast to the deep South, The Revolution Where You Live has stories that spark ideas and inspire hope. Ralph Nader tells us how build a movement that can bridge left and right to promote real democracy. His new book is Breaking Through Power: It’s Easier Than We Think.